It’s the playoffs, so of course every game could be the last game for the remaining teams. But in Baileyville B&B’s case, every game could be its final game in school history. B&B, a perennial power in 8-Man football, is having its school closed at the end of the year and will be consolidated with Nemaha Valley. The Falcons opened the season with a 29-28 loss to Madison. Since then, they have cruised to nine consecutive victories, including a 34-22 win against Hanover. Quarterback Dustin Rottinghaus ran for three touchdowns, and Neil Sudbeck ran for 150 yards and two TDs during the Falcons’ 50-0 playoff win against Southern Cloud. Rottinghaus has passed for about 1,700 yards on the season. Waverly, which lost 50-0 to Marais des Cygnes Valley in the fourth week of the season, beat Stafford 24-20 on Tuesday. Austin Bailey ran for 160 yards and two touchdowns. South Barber makes the long 280-mile trip to Hanover to take on the Wildcats in the Regional round of the Eight-Man, Division II playoffs. On Tuesday, South Barber outscored Chetopa 34-8 in the second half to win 60-34. Junior quarterback Peyton Yandel rushed for 393 yards and four touchdowns in the game. Dylan Allison also rushed for four scores as part of his 165-yard night. The Chieftains may have some concern on defense as Chetopa’s Derrick Cassell rushed for 342 yards and four touchdowns in Tuesday’s game. On the season, Yandel has passed for 1,076 yards and 16 touchdowns and rushed for 1,630 yards and 32 touchdowns. Hanover opened the playoffs with a 52-0 shutout at Hope. The Wildcats scored on every possession in a game that ended at halftime. Hanover scored 38 points in the first quarter. Preston Jueneman scored three touchdowns for the Wildcats, while Kent Bruna and Drew Bruna each scored twice. Hanover will find a way to slow down Yandel and Allison enough to advance. Victoria defeated Ingalls 50-0 behind a big game from running back Bryan Dome. 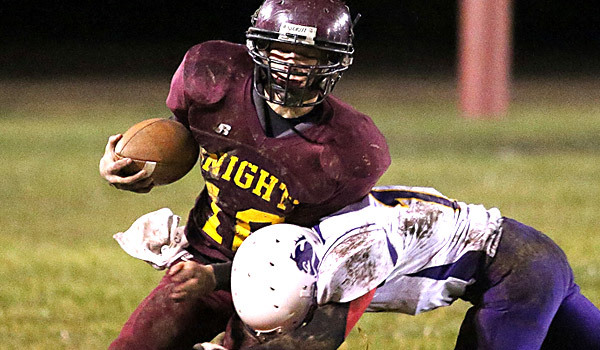 The Knights have won six straight games since senior quarterback Sam Ottley suffered a season-ending knee injury. Senior running back/defensive back Clayton Roth has been out since early Week 1 with a collarbone injury. St. John’s-Tipton lost to Wallace County in the first round last year, but bounced back with a 48-0 victory against Weskan on Tuesday. Junior quarterback Trey Dubbert has completed 54 of 91 passes for 931 yards with a 18/3 TD/INT ratio. Senior Connor Eilert leads a strong rushing attack with 111 carries for 855 yards and 18 scores. At full strength, Victoria is capable of a state crown. However, the Knights – who now start six non-seniors – don’t have enough to stay with a Blujay roster with 24 players and seven seniors. Wallace County played like a state championship-esque team with a 53-6 victory against Thunder Ridge in a contest that was called late in the fourth quarter because of the 45-point mercy rule. The Wildcats had lost to Thunder Ridge in the playoffs the last three seasons. Wallace County led 22-0 midway through the first quarter and 33-6 at halftime despite 14 penalties. Senior quarterback Kyle Gfeller led an outstanding all-around effort when he threw for 162 yards, rushed for 124 yards, kicked a 33-yard field goal and recorded two tackles for loss. Running back Nate Klinge had 10 carries for 100 yards and two scores, while wide receiver Cayden Daily hauled in five passes for 112 yards and two scores and returned a fumble 72 yards. Dighton delivered a 54-6 victory against Fowler. Dighton led 24-0 early in the game and 32-8 at intermission. The Hornets, with just 12 players, collected its third playoff win in school history. The only other year Dighton won a postseason game was 1995. Dighton averages 37 points per game behind speedy senior back Isaac Alinor. This is a rematch from Week 1 when Wallace County defeated Dighton, 51-0. Wallace County is playing at a high level and delivers a victory.